There four types of agni. Ayurveda classifies four different states of agni that point to certain constitutional tendencies. Visham agni: This is an irregular appetite and digestive system with signs of variable hunger, bloating, indigestion, intestinal cramps, constipation, dry stool, borborygmus and gas. It is common in vata types. Use of sweet and pungent flavours. include hingvashtaka, trikatu and ginger is advised before you eat in this kind of vikriti. Tikshna agni: Intense hunger but with poor digestion is a pitta sign. also thirst, parched mouth, dry throat, loose stool and a burning sensation in intestines can lead to diagnosis of tikshna agini. Use of mild sour flavours to dilute excess acid. include shatavari, guduchi and amalaki formula is advised to balance pitta. Mandagni: Weak hunger is a kapha sign. also slow digestion, heaviness after a meal, sluggish bowels, bulky stool, feeling cold, sweet craving, stimulant craving are signs of mandagni. Use of pungent and bitter flavours, trikatu, ginger and cinnamon etc are advised in such vikriti. Samagni: Balanced hunger and digestion; food is digested within 4 hours with no excess craving or lack of interest. Use of triphala is advised to maintain a healthy digestive system. How to balance agni ? The best advice is to follow the body. try to eat when hungry, gently stoking the digestive fire with small meals and trying not to smother it with foods that are excessively cold, heavy or wet. Do not aggravate it with excess spicy, oily or fried foods. • Leave 4-6 hours between meals with no snacking. • The sign that the previous meal is digested is when the breath is fresh. • Eating in between meals weakens the agni. • Eating foods with cold, wet and heavy qualities weakens the agni. 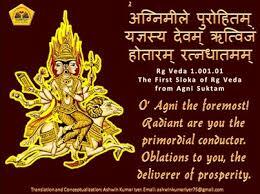 • Drinking hot water ie lukewarm is advised to stimulate agni. • Treat agni with occasional fasts, use a single-mono-diet (e.g.rice, kichari), hot lemon water and a seasonal cleanse to keep digestion healthy. • Agni is increased by pungent, sour and salty flavours and so start a meal with these flavours. • A low dosage of bitter taste taken before a meal increases the secretion of hydrochloric acid in the stomach. • Agni stimulating and increasing herbs are ginger, black pepper, cinnamon, long pepper, guduchi, kalmegh. Use a small dose (1-2g) before meals to enkindle the digestive fire. • Agni tonic herbs that build enduring digestive strength are pushkaramoola, cardamom, musta etc. • Yoga exercises to balance and stimulate agni : The agnisara kriya, nauli, kapalbhati, bhastrika, mayurasana, paschimottanasana, matsyendrasana, surya namaskar.